The Alpkit Hunka Bivvy bag has become a modern cult item of outdoor gear due to its incredible value for money and good all round performance. The bags are available in three colours: chilli (red), lego (blue) and a very subtle kelp colour. The regular size weighs 330g and the XL comes in at 495g. On review the bag was very effective at keeping out moisture and generally good at breathing, leaving minimal condensation inside the bag. 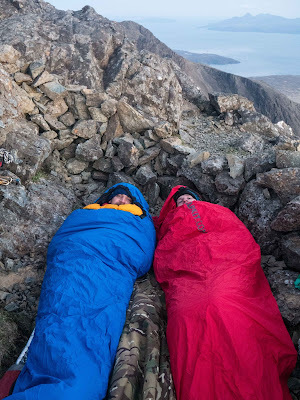 The two sizes were tested and although the regular size was ok for size (reviewer is 6ft and 85kg) it was a little snug and using anything but our summer sleeping bag (PHD Minimus) it was too tight. The XL, however, was an excellent size, allowing space to put in some additional layers and storing some kit in the bag (useful for boots and the likes). The XL would definitely be this reviewer's recommendation if we had to settle on one of the two bags. The only real downside of the bags is it's popularity resulting in some periods of short supply at Alpkit. The closure of the bag is also very simplistic making it difficult to pull the bag over one's face if it starts raining, however, how often do we catch ourselves intentionally Bivvying out in the rain without a tent? In summary, a great piece of kit from the guys at Alpkit. Things we like: Value for money, performance, great customer service, low weight. Things we don’t like: Occasional lack of stock.